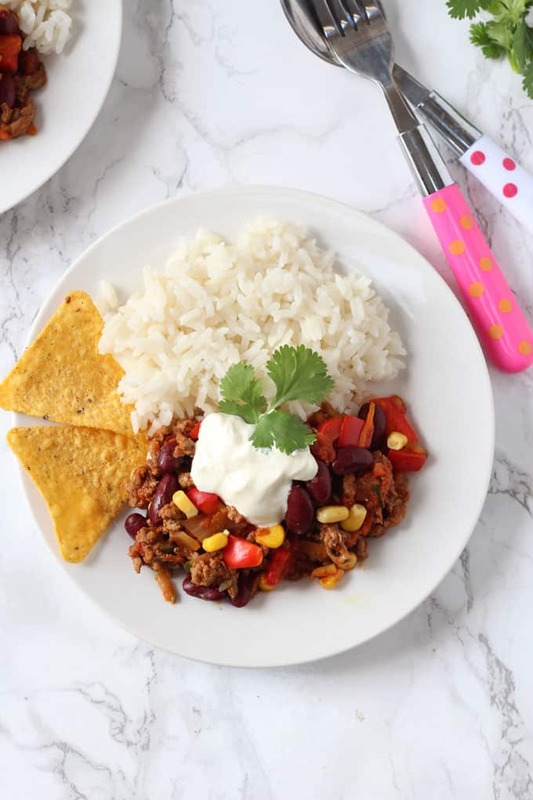 A tasty and mild Chilli Con Carne recipe for kids that’s packed full of lots of vegetables too! Meal times have been a bit of a struggle in my house lately. My little boy is going through a particularly tricky picky eating phase and the list of things he will eat is getting smaller by the day! 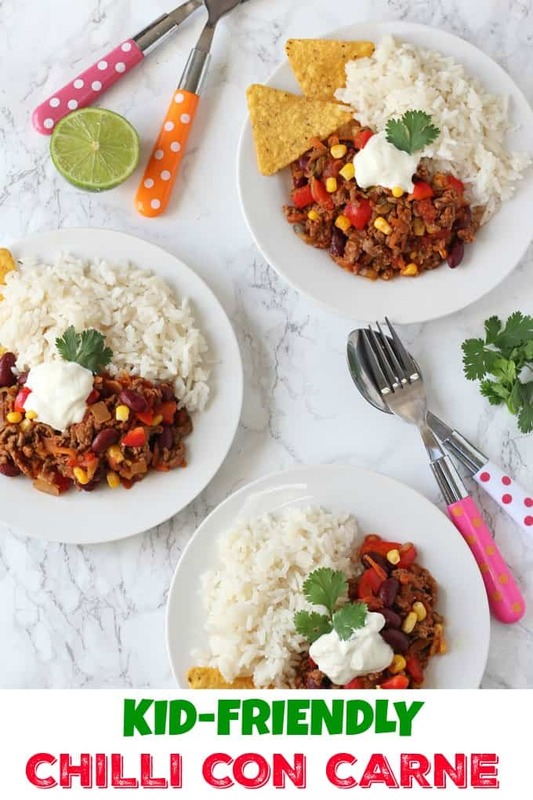 But thankfully this really easy Chilli Con Carne recipe is still on his acceptable list of foods so I’ve been making it at least once a week! This recipe is really simple to make. The list of ingredients might look a bit long but don’t let that put you off as you probably have most of the spices at home in your cupboard anyway! 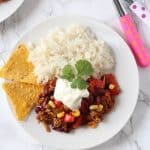 I’ve kept this dish really mild so it’s perfect for kids but if you prefer your chilli with a bit more of a kick then double the quantities. 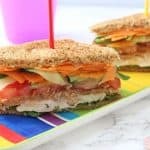 I have managed to squeeze four different veggies into this recipe – the carrots and courgette are grated so that they cook down with the meat and your fussy eaters won’t even know that they are there. The peppers and corn are left in small pieces but they add a lovely pop of colour to the dish. The grated veggies not only help boost the nutritional value of this chilli, but they also help to bulk out the whole dish, making it go a little further and make the meal more budget-friendly. 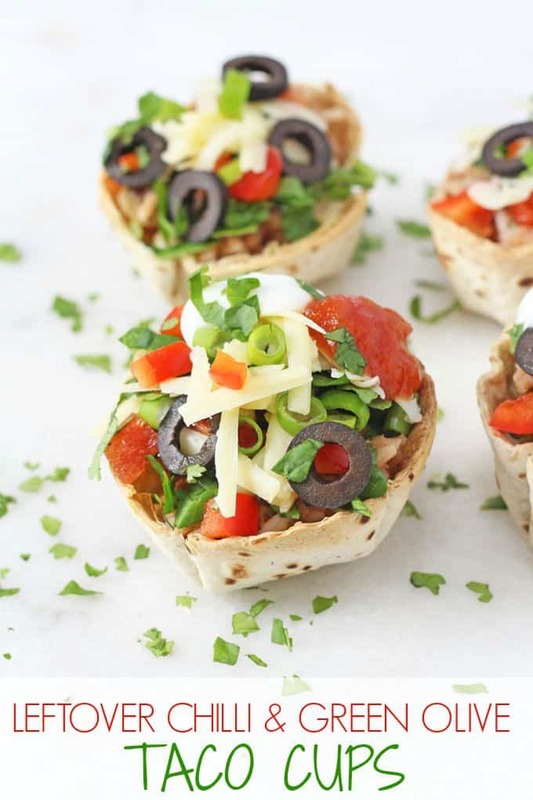 Check out my Leftover Chilli Taco Bowls which are a really fun way to serve leftover chilli the next day! 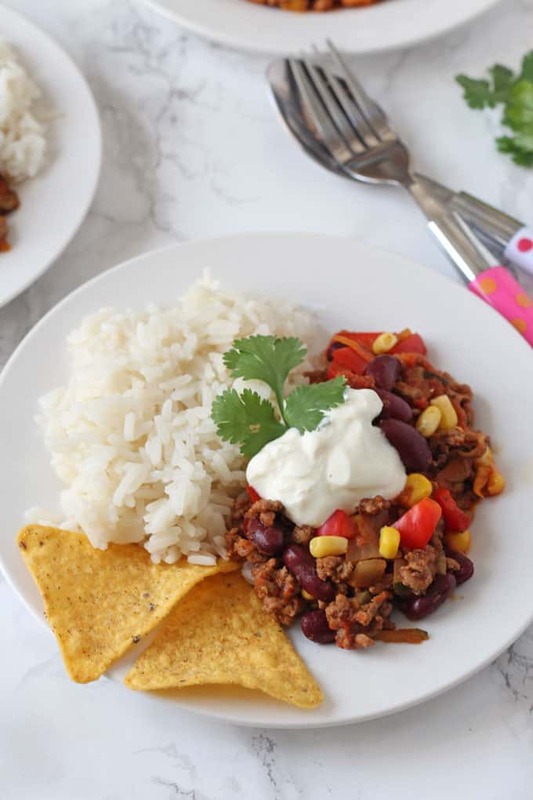 I serve my chilli with boiled rice, sour cream and a few tortilla chips on the side – the kids absolutely love this as they see having “crisps” for dinner as such a treat! If you try this recipe please do let me know what you think. Or tag me in a picture on Facebook, Twitter or Instagram. I’ve really been enjoying seeing all your creations. 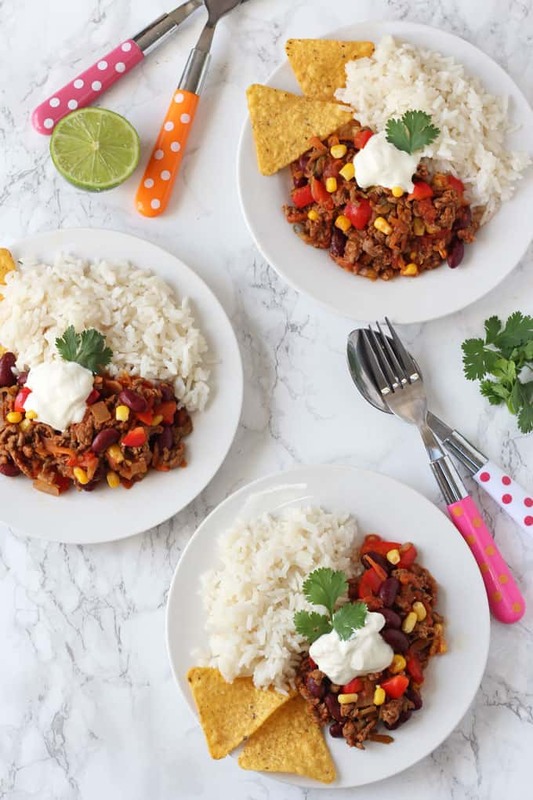 A tasty and mild Chilli Con Carne recipe for kids that’s packed full lots of vegetables too! Heat the oil in a large dish on the hob. Add the onion and fry over a medium heat for 2 to 3 minutes until it starts to soften. Add the garlic, grated carrot and grated courgette and fry for another 2 minutes. Add the spices – smoked paprika, ground coriander, ground cumin and chilli powder and mix well. Add in the beef mince and fry for another 4 minutes or until the meat has browned. 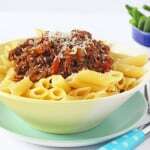 Pour in the tinned tomatoes and beef stock and leave to simmer for 15 minutes. Add in the kidney beans, red pepper and corn and cook for another 3-4 minutes. Remove from the heat and add in some fresh lime juice to taste. Serve immediately with rice, sour cream and tortilla chips. This is a great family meal to make in bulk. It can be kept in the fridge in an airtight container for 48 hours or frozen and kept in the freezer for up to 3 months. My husband and I had this with tacos last night. Very tasty and we were quite happy with it. Unfortunately Miss Fussy Two and a Half refused to try it. We are having it again tomorrow night so here is hoping she will try it. For tacos or burritos (two tacos each and a tablespoon for Miss Fussy Two and a Half) the mixture will last us four nights which is extremely awesome. Love how many veggies are in this. It’s much better than my normal recipe for chilli that I’ve been making for years so will use this one every time now! 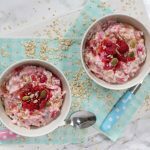 I make this recipe every week! My partner and three kids all love it!